The fifth SpaceX cargo mission to the International Space Station (ISS) under NASA’s Commercial Resupply Services contract now is scheduled to launch at 6:20:29 a.m. EST Tuesday, Jan. 6, from Space Launch Complex 40 at Cape Canaveral Air Force Station in Florida. NASA Television coverage of the launch begins at 5 a.m. The new launch date will provide SpaceX engineers time to investigate further issues that arose from a static fire test of the Falcon 9 rocket on Dec. 16, and will ensure proper sun angles for thermal and operational conditions to berth Dragon. 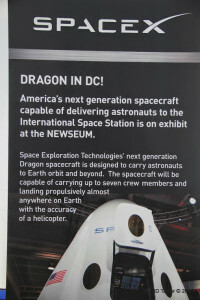 An on-time launch on Jan. 6 will result in the Dragon spacecraft arriving at the space station on Thursday, Jan. 8. Expedition 42 Commander Barry “Butch” Wilmore of NASA will use the station’s 57.7-foot robotic arm to reach out and capture Dragon at approximately 6 a.m. Flight Engineer Samantha Cristoforetti of the European Space Agency will support Wilmore as they operate from the station’s cupola. NASA TV coverage of grapple will begin at 4:30 a.m. Coverage of Dragon’s installation to the Earth-facing port of the Harmony module will begin at 8:15 a.m. 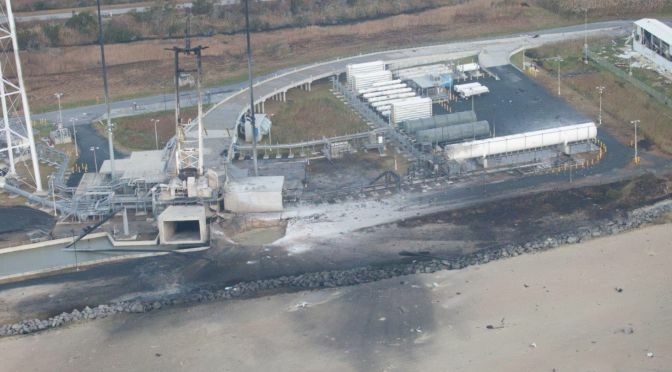 The October explosion of the Orbital Science ORB-3 resupply mission rocket destined to the International Space Station caused an estimated $20 million damage to Mid-Atlantic Regional Spaceport’s (MARS for short) pad 0A. It was not clear where the funding would come from to repair the damage. The state Virginia had stated that they did not have the budget to cover the expense. Included in the 1.1 trillion Federal spending bill passed by the House last night (12/11/2014) was the $20 million to cover the pad damage. The Senate is to vote on the bill as early as Friday. NASA’s overall budget will be increased by 2% to $18 billion next year, that is a $364 million increase over current levels. Rep. Scott Rigell, R-2nd, also worked with the Mid-Atlantic Regional Spaceport and the House Appropriations Committee to secure funding in the bill to restore the launch pad, according to his press secretary, Kaylin Minton. 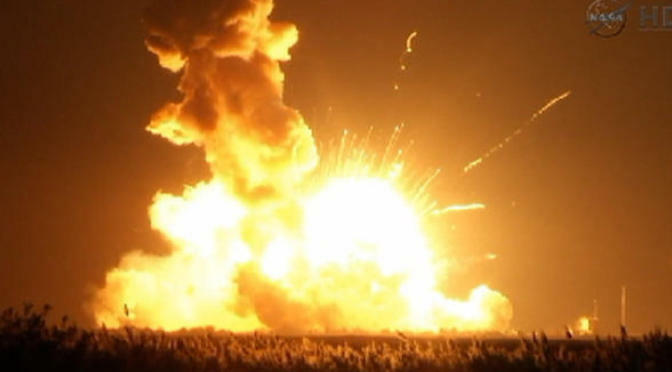 Democratic senators Mark Warner and Tim Kaine announced Thursday they’d sought the spending provision in an effort to help the Mid-Atlantic Regional Spaceport, known as MARS, “rebound” from that catastrophic launch failure. MARS is located at the NASA Wallops Flight Facility on the Eastern Shore. “The announcement that the compromise spending Bill expected to be voted on and passed by Congress this week contains $20 million in Federal funding for repairs to the Mid-Atlantic Regional Spaceport is great news. 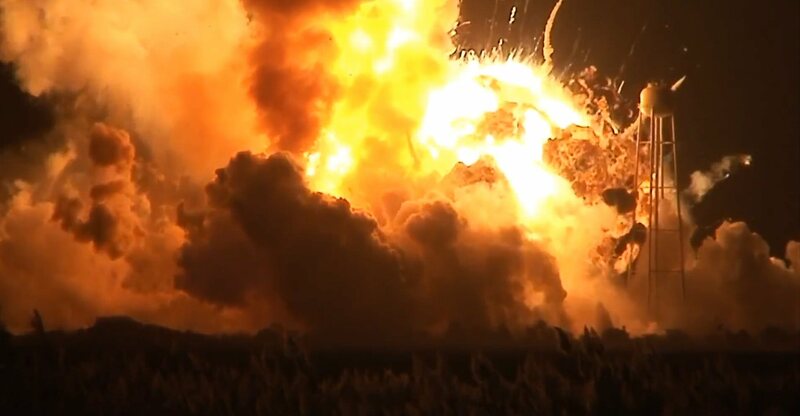 It clearly indicates the importance of our Wallops Island launch facility to the future of commercial space launches. I want to thank Senator Warner, Senator Kaine and Congressman Rigell for all of their hard work to include this funding in the compromise Bill. Hurricane Gonzalo pushes toward Bermuda and that pushes ORB3 launch to back to “no earlier than” (NET) Oct 27, 2014. “The Wallops range relies on the Bermuda downrange assets to track and maintain data communications with the Antares rocket during flight and ultimately to ensure public safety during launch operations,” said Steven Kremer, Chief of the Wallops Range and Mission Management Office. 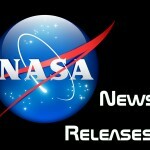 Due to the impending arrival of Hurricane Gonzalo on the island of Bermuda, where an essential tracking site used to ensure public safety during Antares launches is located, the previously announced “no earlier than” (NET) launch date of October 24 for the Orb-3 CRS mission to the International Space Station for NASA is no longer feasible. Once the hurricane has passed Bermuda, a team from NASA’s Wallops Flight Facility Range will return to the tracking site to assess the situation and begin the process of re-enabling the site’s functionality to support the launch. Today, Orbital and NASA together established a NET October 27 for the launch of the Orb-3 mission from the Mid-Atlantic Regional Spaceport at NASA Wallops. However, depending on the impact of the storm on Bermuda’s essential infrastructure systems such as transportation, power and communications, the launch date could be moved later. The launch schedule has been established in order to build flexibility into the overall mission schedule. 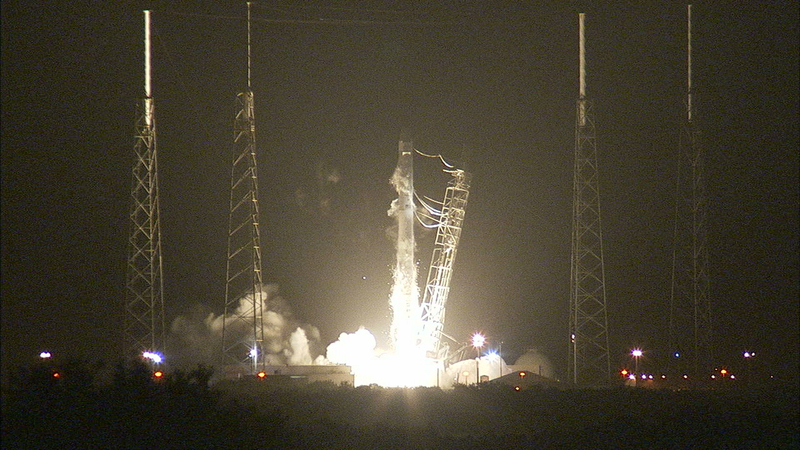 For an October 27 launch, lift-off time of the Antares rocket is targeted for 6:44 p.m. (EDT). The rendezvous and berthing of Cygnus with the ISS remains on November 2, with grapple of the spacecraft by the station’s robotic arm at approximately 4:58 a.m. (EST). Launch date of the Orb-3 mission has been pushed back a little to October 24, 2014. This should be a spectacular night launch with a targeted lift-off time of 7:52 p.m. (EDT) from the Mid-Atlantic Regional Spaceport (MARS), located at Wallops. Designated the “Orb-3” or “#ORB3” for Twitter, it will be the fourth Orbital Science “Cygnus cargo mission” to the ISS and the fifth Antares launch in the last 18 months. A two-stage Antares rocket carrying Orbital’s Cygnus cargo spacecraft is scheduled to lift-off from the Mid-Atlantic Regional Spaceport at Wallops Island, Virginia on Pad-0A. The current schedule is for “no earlier than October 20, 2014” with a targeted launch time for the 20th of 9:29 pm (EST) reaching the International Space Station (ISS) approximately 3 days later. After separation from Antares, the Cygnus spacecraft will deploy its solar arrays and undergo initial check-out. The spacecraft will bring itself within 4 km (about 2.5 miles) of the ISS prior to receiving authorization to autonomously rendezvous with the station. When the vehicle approaches to within 12 meters (about 50 ft), the ISS will use it’s robotic arm to grapple Cygnus and berth it to the Harmony node of the station. 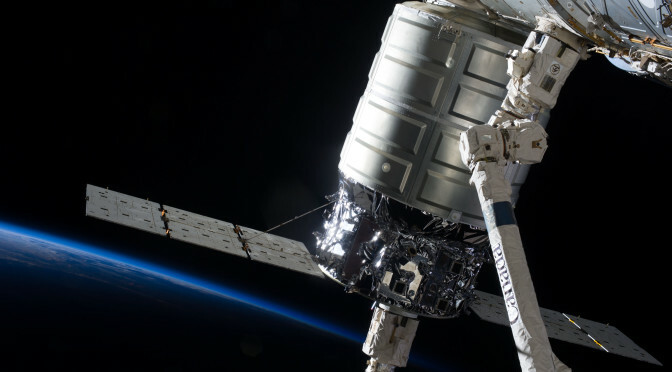 Cygnus is planned to remain connect to the ISS for approximately five weeks during while the station crew unloads supplies and reloads it with materials for disposal. After Cygnus departs the station, it will reenter the Earth’s atmosphere. For this mission Cygnus will carry approximately 2,290 kg (5,050 lbs.) of cargo to the ISS for NASA. The Orb-3 launch will be viable from much of the east coast on the US and will be broadcast live on NASA TV. .
A SpaceX Falcon 9 rocket with a Dragon cargo spacecraft on top launches from Cape Canaveral Air Force Station’s Space Launch Complex-40 in Florida at 1:52 a.m. EDT, Sept. 21, 2014. 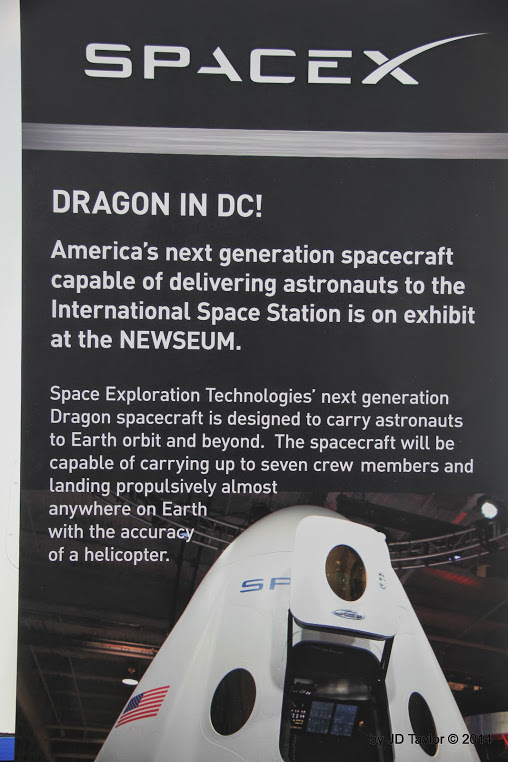 The Dragon is carrying more than 5,000 pounds of supplies, science experiments, and technology demonstrations includes critical materials to support 255 science and research investigations during the station’s Expeditions 41 and 42. About 5,000 pounds of NASA science investigations and cargo are on their way to the International Space Station aboard SpaceX’s Dragon spacecraft. The cargo ship launched on the company’s Falcon 9 rocket from Space Launch Complex-40 at Cape Canaveral Air Force Station in Florida at 1:52 a.m. EDT Sunday, Sept. 21. The mission is the company’s fourth cargo delivery flight to the space station through a $1.6 billion NASA Commercial Resupply Services contract. Dragon’s cargo will support experiments to be conducted by the crews of space station Expeditions 41 and 42. One of the new Earth science investigations heading to the orbital laboratory is the International Space Station-Rapid Scatterometer. ISS-RapidScat monitors ocean winds from the vantage point of the space station. This space-based scatterometer is a remote sensing instrument that uses radar pulses reflected from the ocean’s surface from different angles to calculate surface wind speed and direction. This information will be useful for weather forecasting and hurricane monitoring. 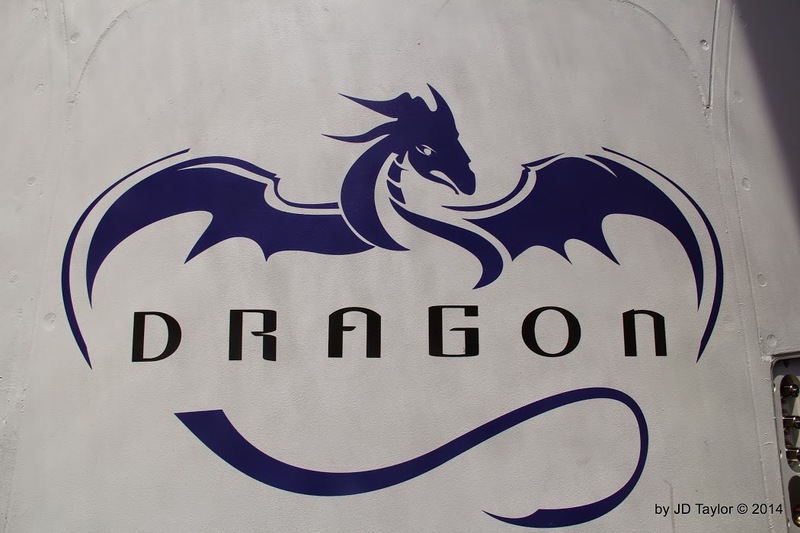 Dragon also will deliver the first-ever 3-D printer in space. The technology enables parts to be manufactured quickly and cheaply in space, instead of waiting for the next cargo resupply vehicle delivery. The research team also will gain valuable insight into improving 3-D printing technology on Earth by demonstrating it in microgravity. 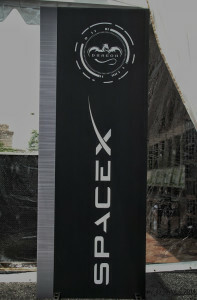 The Dragon spacecraft will also transport other biological research, include a new plant study. The Biological Research in Canisters (BRIC) hardware has supported a variety of plant growth experiments aboard the space station. The BRIC-19 investigation will focus on the growth and development in microgravity of Arabidopsis thaliana seedlings, a small flowering plant related to cabbage. Because plant development on Earth is impacted by mechanical forces such as wind or a plant’s own weight, researchers hope to improve understanding of how the growth responses of plants are altered by the absence of these forces when grown in microgravity. 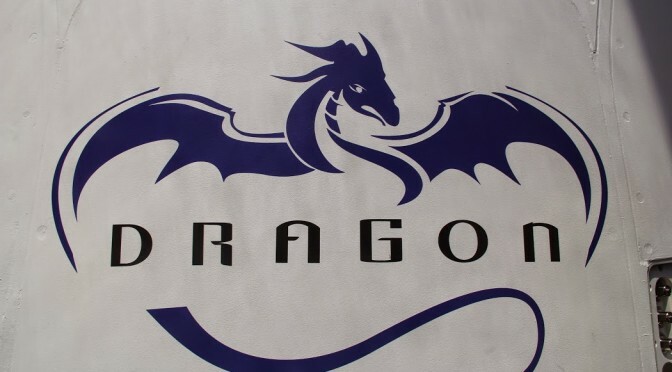 Dragon is scheduled to be grappled at 7:04 a.m. on Tuesday, Sept. 23, by Expedition 41 Flight Engineer Alexander Gerst of the European Space Agency, using the space station’s robotic arm to take hold of the spacecraft. NASA’s Reid Wiseman will support Gerst in a backup position. 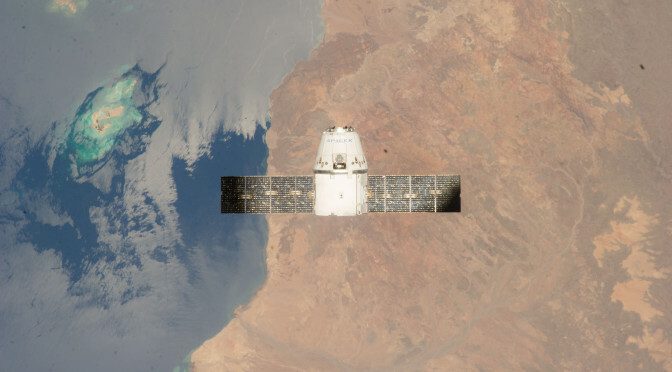 Dragon is scheduled to depart the space station in mid-October for a splashdown in the Pacific Ocean, west of Baja California, bringing from the space station almost 3,200 pounds of science, hardware and crew supplies. The space station is a convergence of science, technology and human innovation that demonstrates new technologies and makes research breakthroughs not possible on Earth. 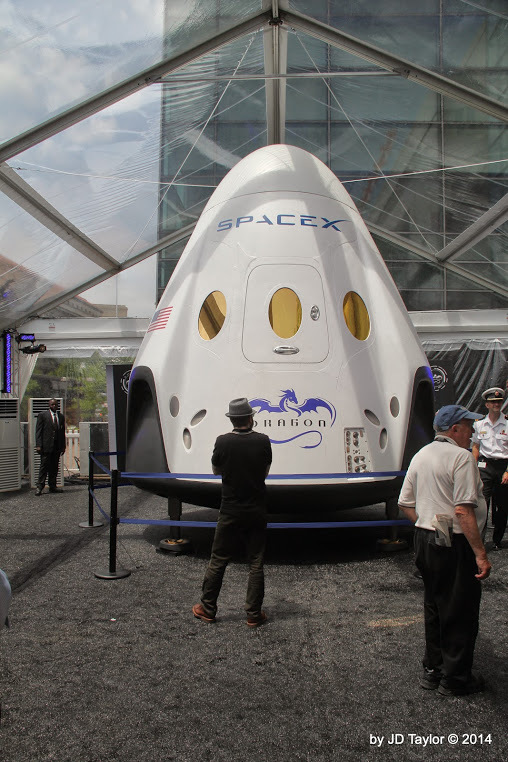 NASA recently awarded contracts to SpaceX and The Boeing Company to transport U.S. crews to and from the space station with the goal of certifying those transportation systems in 2017. At a Launch Readiness Review Saturday, managers for Orbital Sciences Corp. of Dulles, Virginia, and NASA gave a “go” to proceed toward the Sunday, July 13 launch of the Orb-2 cargo resupply mission to the International Space Station. Orbital is targeting a 12:52 p.m. EDT launch from the Mid-Atlantic Regional Spaceport Pad 0A at NASA’s Wallops Flight Facility in Virginia. NASA Television coverage of the launch will begin at noon. There is a 90 percent chance of favorable weather at the time of launch. 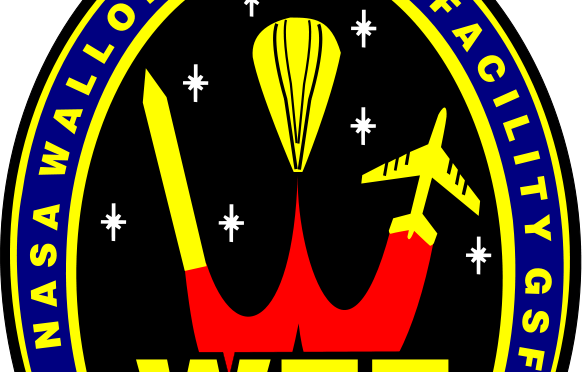 NASA TV will broadcast a prelaunch news briefing today from the Wallops visitors center at 4:30 p.m. 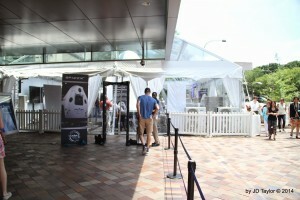 The briefing will be carried live on NASA TV and the agency’s website at http://www.nasa.gov/ntv. 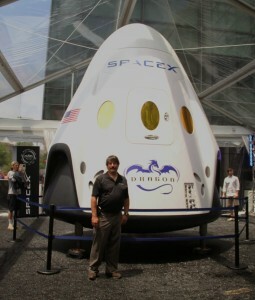 For more information about the mission, visit: http://www.nasa.gov/orbital and http://www.nasa.gov/station. Orbital has established July 11, 2014 as the targeted date for the launch of the Orb-2 mission to the International Space Station (ISS), the second operational cargo resupply mission under the company’s Commercial Resupply Services (CRS) contract with NASA. The targeted launch time from the Mid-Atlantic Regional Spaceport at NASA’s Wallops Flight Facility on July 11 will be 1:40 p.m. (EDT). 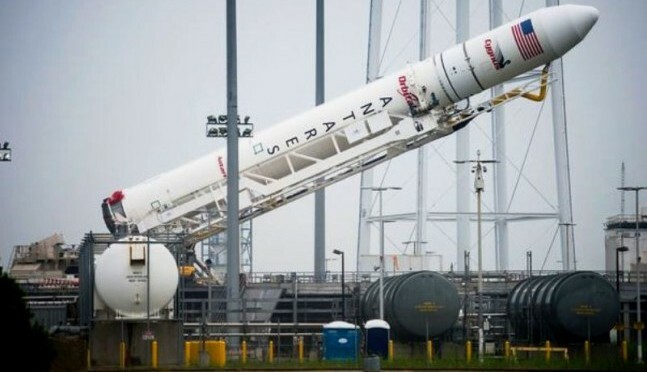 The engineering team that is investigating the failure of an AJ26 engine during an acceptance test at Stennis Space Center recommended that certain inspections be performed on the two AJ26 engines that are currently integrated on the Antares rocket. These inspections were recently completed and program officials have cleared the rocket for flight. Leading up to the launch, the Cygnus cargo logistics spacecraft will be mated to the rocket today. 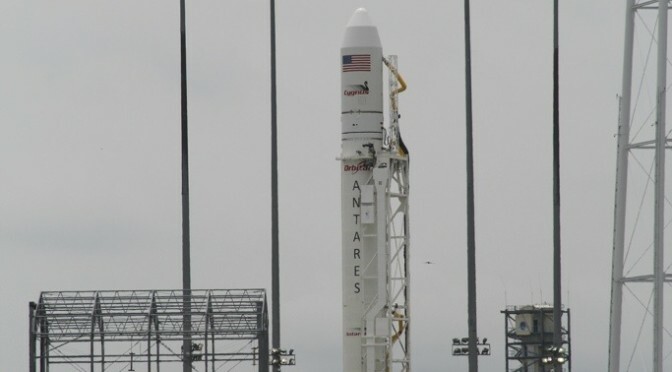 After the loading of the final time sensitive cargo and installation of the rocket’s payload fairing, Antares will be rolled out to the launch pad on July 9. A launch on July 11 will result in a rendezvous and berthing with the ISS on July 15. The Cygnus spacecraft will deliver 1,657 kg of cargo to the ISS and will be loaded with approximately 1,346 kg of material for disposal upon reentry into Earth’s atmosphere. 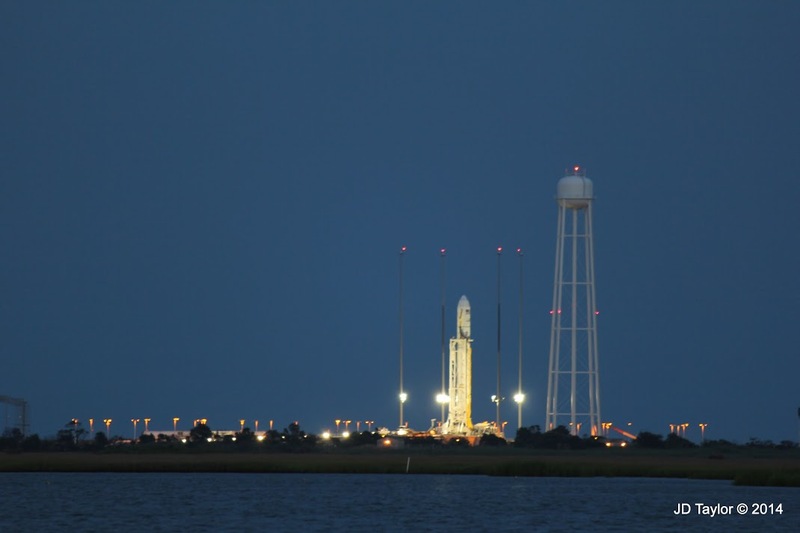 Orbital Sciences and the International Space Station Program officially have set Friday, July 11, as the launch date for the Antares rocket and the Cygnus cargo craft on the Orbital-2 resupply mission to the space station. Launch time on July 11 is 1:40:27 p.m. EDT from NASA’s Wallops Flight Facility in Virginia. NASA Television coverage will begin at 1 p.m.
A launch on July 11 will result in the rendezvous and grapple of Cygnus by Expedition 40 Commander Steve Swanson of NASA and Flight Engineer Alexander Gerst of the European Space Agency at 7:24 a.m. on Tuesday, July 15. Rendezvous coverage on NASA TV will begin at 6:15 a.m.
NASA TV also will provide coverage of Cygnus’ berthing to Harmony beginning at 9:30 a.m.
Cygnus will remain berthed to the station until August 15. 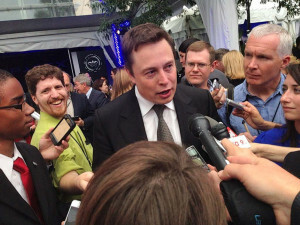 “Lockheed and Boeing are used to stomping on new companies” Musk talking to media while in DC hosting the Dragon V2 in DC event (Wed, June 10, 2014). Aaron Mehta, Intercepts Defense News reporting. 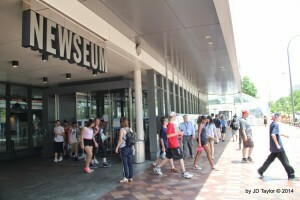 A Dragon was spotted near the Newseum in DC!!!! The Dragon Version 2 space capsule, SpaceX’s next generation manned spacecraft was on public display for one day only (June 11, 2014) on the Newseum Plaza off Pennsylvania Avenue. 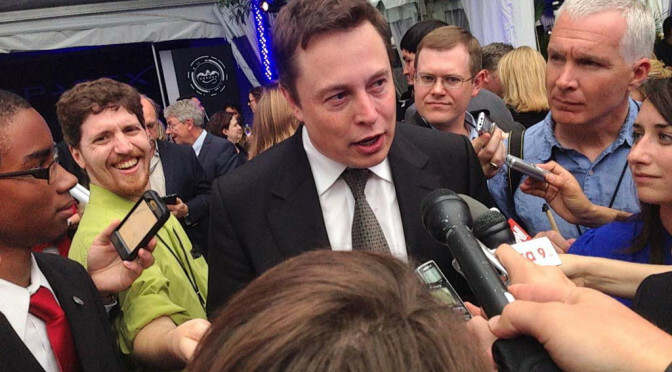 It followed a media event the day before hosted by Elon Musk.